Pripyat amusement park, Pripyat – abandoned after the Chernobyl disaster; the park's Ferris wheel, which is currently standing but not operating, serves as a poignant reminder of the massive human effect of the disaster. Guyton's Fun Junction, Grand Junction. Now a shopping center that includes Fun Junction Liquors and a Hooters restaurant. Pleasure Beach, Bridgeport (1892-1958) - the area reopened for beach access as of June, 2014. White City, Chicago (May 26, 1905–1950s) - most of the park was shut down in 1933 due to financial difficulties, with the property being sold off in 1946; the rink, the last vestige of the park, closed in 1958. White City (Shrewsbury, Massachusetts) in 1908. The colossal figure of "King Dodo" guards the entrance to the fun house. 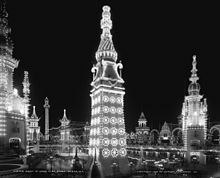 Old Vegas, Henderson (1978-1986) - briefly renamed Westworld; now the site of a housing development, also named "Old Vegas"
Interior of Luna Park, Coney Island at night, 1905. Electric tower in the foreground. New York, United States of America. Storytown, USA, Queensbury/Lake George, New York (1954–1983). In 1983 the name was changed to The Great Escape & Splashwater Kingdom and the park's theme was revamped. Sand Springs Lake Park, Sand Springs (1912-1956) - Built by Charles Page to attract Tulsans to ride his new streetcar to Sand Springs. The park had rides, a zoo, and a lake for swimming. The carousel had large hand carved animals. Funtown, Millcreek - The water slides were sold to Waldameer Park and the land became a church parking lot. 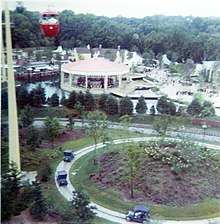 View from the Skyride circa 1975. The "Tin Lizzies" old-timey car ride is visible. Opryland USA, Nashville, Tennessee. Texas Cyclone at 4:30 p.m. on October 30, 2005, AstroWorld's last day of operation. Houston, Texas. Luna Park Seattle, Washington, 1910. In the foreground is part of the Great Figure Eight roller coaster. At right rear is the Zeum carousel, and to its left the natatorium. ^ "Inside Japan's haunting, long-abandoned theme park". Retrieved 2016-08-10. ^ "Abandoned water park in vietnam". Mail Online. Retrieved 2017-09-12. ^ A szomorú vidámpark Archived 2013-09-14 at the Wayback Machine. Szellemváros blog. Retrieved 14 September 2013. ^ "Ghostly Chernobyl now hot with tourism – 10/06/05". Retrieved 2007-11-04. ^ "Panoramio – Photo of Pripyat Vergnügungspark". Retrieved 2007-11-04. ^ "The fun stopped here: England's derelict theme parks". BBC News. 7 March 2018. ^ Kinn, Gail; Piazza, Jim (2014-12-16). Academy Awards®: The Complete Unofficial History -- Revised and Up-To-Date. Black Dog & Leventhal. ISBN 9781579129866. ^ "Planet Ocean : one of Florida's Lost Tourist Attractions". lostparks.com. Retrieved 2017-07-06. ^ "Wild Waters Ad". Ocala Star-Banner. April 27, 1978. Retrieved August 1, 2017. ^ Westworld (Old Vegas) Theme Park Sign | Flickr – Condivisione di foto! ^ Old Vegas (Westworld), Henderson, Nevada | Flickr – Condivisione di foto! ^ a b c d Stewart, Chris (February 16, 2017). "7 Amusement Parks in Southwest Ohio that Faded into History". www.mydaytondailynews.com. Retrieved August 23, 2017. ^ McGregor, Kenneth. "Brady Lake Electric Park". Retrieved 26 May 2015. ^ "P&LE Sells Aliquippa Park". New Castle News. September 20, 1905. p. 2. Report has it that Jones and Laughlin Steel Company will in future, use it as industrial site - Rail and Roundhouse News. ^ "Dismantling Picnic Ground; Aliquippa Park Is Making Way for New Steel Mills". The Daily Notes. Canonsburg. January 15, 1907. p. 1. ^ Davis, Michelle R. (December 1, 1991). "Short-lived Trip: Taking A Trolley To Rides At Park". The Philadelphia Inquirer. Retrieved June 20, 2015. ^ "Calhoun Park for Lot Plan". The Pittsburgh Post. November 16, 1916. p. 14. The Homestead Realty Company has purchased from the Philadelphia Company the old Calhoun park property for $28,000. ^ Ackerman, Jan (October 21, 2002). "Small city neighborhood caught in fight over land for community center". Pittsburgh Post-Gazette. Retrieved June 21, 2015. One of the most interesting things they found was that an amusement park called Calhoun Park was opened in 1895 by Pittsburgh Railways Company on Mifflin Road, where the trailer park now stands. The park closed about 1910. ^ Whelan, Frank (August 26, 2011). "Central Park once the Lehigh Valley amusement mecca died 60 years ago this summer". WFMZ-TV. Retrieved June 21, 2015. 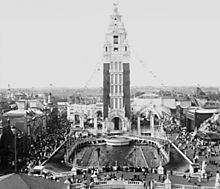 ^ "Public Sale: Coney Island Amusement Company". The Gazette Times. Pittsburgh. November 8, 1908. p. S5-5. ^ "Neville Island Park. Bathing Beach With 1,000 Bath Houses to Be Feature at New Resort". The Pittsburgh Post. October 21, 1906. p. 11. ^ "Another "Coney Island."". Reading Times. October 25, 1906. p. 4. ^ "Coney Island's Opening". The Gazette Times. Pittsburgh. May 26, 1907. p. 27. The new Coney Island Park, located on Neville island, some seven miles down the Ohio river, will be opened to the public on Saturday, June 8. ^ "Hanson's Amusement Park" (PDF). Harveyslake.org. Retrieved June 21, 2015. ^ "Shamokin Men Head Project For A Big Park Near Sunbury; Corporation, Headed by Selin M. Wiest of This City, Closes Deal for Eighteen-acre Site on Island Park, Sunbury. Plan Outlay of $150,000 for the Erection of Buildings and Amusement Devices". Shamokin News-Dispatch. May 24, 1923. pp. 1, 4. ^ "Lakeview Park on the Rollercoaster Database page". ^ "Strohl to Proceed With Dance Building". The Scranton Republican. January 26, 1931. p. 3. ^ "An Amusement Park For Clark's Summit". The Scranton Truth. February 13, 1909. p. 8. ^ "Northern Electric Park Opens Today". The Scranton Truth. May 21, 1910. p. 9. ^ "No title". The Scranton Republican. August 15, 1925. p. 8. 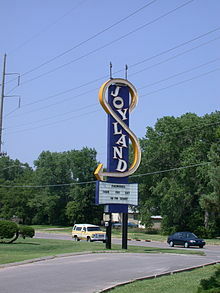 The closing of Northern Electric Park as an amusement resort eliminates one of the best known local places of the kind. ^ "Paxtang Park. Attractions Which Will Be Added to the Grounds in a Short Time". Harrisburg Daily Independent. July 20, 1893. p. 1. ^ "Paxtang Park Is Thing Of Past; Remove Houses". The Evening News. Harrisburg, PA. April 21, 1930. p. 1. Paxtang Park, whic [sic] used to be a trolley park when local residents rode out into the country at Paxtang for five cents, is a thing of the past. ^ "Magic Valley theme park opens". The Pocono Record. June 30, 1977. p. 13. The Poconos' first theme park officially opens its doors today at the base of Winona Five Falls near Bushkill. ^ O'Malley, Meg (November 24, 2014). "Rainbow Gardens". Popular Pittsburgh. Pittsburgh Sports and Recreation. Retrieved June 21, 2015. ^ "Rock Point". Pittsburgh Commercial Gazette. June 20, 1884. p. 2. The Rock Point property has been purchased by the Pennsylvania Railroad and elegautly [sic] fitted up for Picnic and Pleasure Parties. ^ "Rocky Springs Park History". Rocky Springs Park, LP. 2003. Retrieved June 21, 2015. ^ Kuruvilla, Carol (October 26, 2013). "Abandoned West Virginia amusement park has a bloody history". www.nydailynews.com. Retrieved September 1, 2017. ^ Stanton, Jeffrey. "Lake Shawnee Amusement Park -- Princeton, West Virginia: A Haunted Amusement Park". lostamusementparks.napha.org. Retrieved September 1, 2017. ^ Jones, Meg (May 27, 2011). "Fairy tale ends for Storybook Gardens". jsonline.com. Retrieved September 1, 2017. ^ Adams, Barry (May 22, 2011). "On Wisconsin: Dells' Storybook Gardens closes without storybook ending". Wisconsin State Journal. Retrieved September 1, 2017. ^ St Leon, Mark. "Wirth's Circus". eMelbourne.net.au. Retrieved September 5, 2017. Defunct Amusement Parks of Illinois Over 80 defunct Illinois amusement parks: history and photos. This page was last edited on 19 April 2019, at 16:36 (UTC).